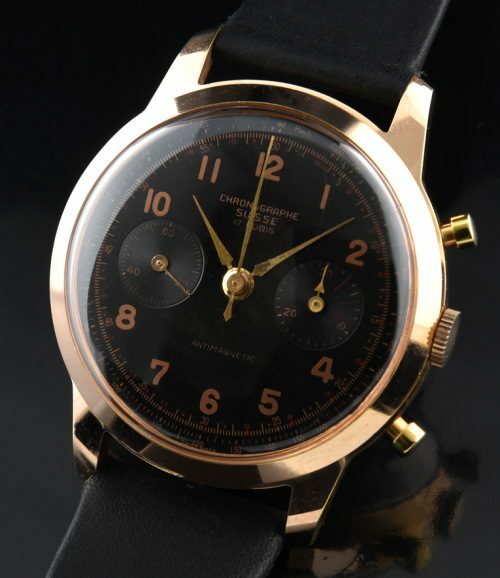 Home / Shop – Vintage Watches For Sale Used & Antique / Sold / Chronographe Suisse Massive 39mm. This is an uncommmon find. The heavy rose gold plated case with steel screw back is essentially close to new old stock condition and measures 39mm.-huge for a 1950’s chronograph! The completely original black dial with rose gold Arabic numerals and rose gilt print is pristine. The hands are all original. You have to see the presence this watch exudes on the wrist…it is stunning. I like the contrast of the small round pushers on the large case as well. The original crown is very slim adding to the fine look of this watch. The Venus 188 movement was just cleaned and is accurate. Chronographs have skyrocketed in value lately. Believe me, this watch is priced so well, you will look back years later and thank me! $1250.